Submitted by Migrate Wizard on 2014-01-04 04:14. You went fishing whilst drunk, capsized, and wake up cold and wet in the Raventhal, a forest with a very sinister reputation. Your one objective is to get out of the forest and return back to your village. How hard can it be...!? This is a short module for the Iceblink Engine - it should take about 2 hours to complete. There's quite a bit of combat, but a big focus on the module is party interaction and story. You start off on your own, but you'll soon find other characters who may join you if you choose. The NPCs are a colourful bunch who talk amongst themselves, disagree with your decisions, and (occasionally) do something useful. Of course, you can always decide just to ignore them all and play solo. It is designed for a one character party. There's no reason why you can't play it with more, but story wise it won't make much sense. The module takes place largely on one map - a forest. It links to several smaller maps that you can also explore. There is a "best route" to completing the module, but it doesn't hold your hand - you have to explore and discover it for yourself. The player should pick any race except forest faery, pseudodragon or homunklus. The player can pick any class, but resting in the Raventhal is not easy and magic users may have a particularly hard time...! The music was written using the excellent Famitracker software, to which I've lost many hours of my life. You start fiddling with it and then you just can't stop. Its a free download and easy to use. Finally, the Raventhal mainly uses borrowed assets. The tiles are standards from the Iceblink tilemapper (with one or two additions! ), the portraits come from NWN and BG mods, and many of the tokens come from goldbox games (a few I've made myself). If anyone objects to the use of any of the art etc. and wants them removed, or would like a credit, please do drop me an email and I'll sort it out. Finally (finally! ), many thanks to Slowdive, Youngneil1, Lurking Grue, Dorateen, and Kamal for comments on advice on previous versions, Slowdive and Youngneil1 for all the scripting help, and Rolo and the Vault for kindly hosting us. Hope you enjoy the module - if you come across any bugs or issues, please do let me know! So I tried it, after 10minutes I encountered combat with four squirels. I moved towards to them, pressed end turn, then they acted moved towards to me and reached melee range so they attacked, first attack on me and critical hit for 7 damage. Game over since my lvl 1 rogue had exactly 7 hitpoints. Funny. Nice. So your party of one with a trusty tree branch failed to take out a few little squirrels? Haha, yeah, those guys are nasty. Probably should pick up some companions first before braving the relentless squirrels . Hi Shadooow, thanks for playing and sorry your first experience wasn't positive! Yeah the squirrels can be a pain, but it sounds like you've been a bit unlucky - they're usually not quite that deadly. Its my first attempt at a module, so the balancing might not be quite right... ahem, ok, so it probably isn't quite right. 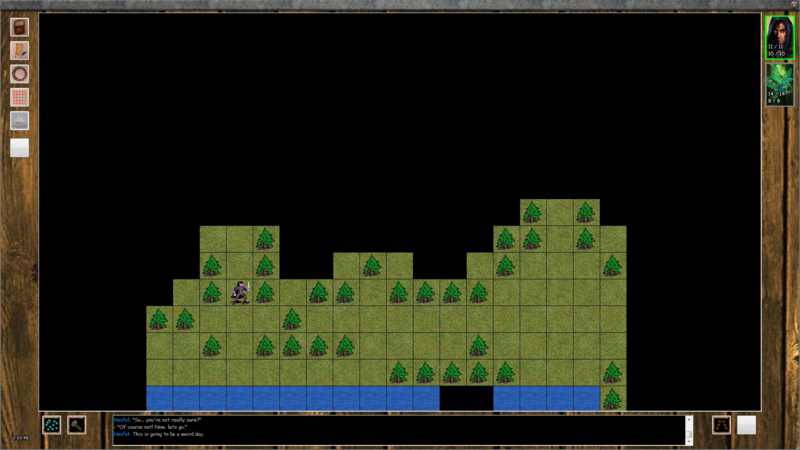 :) If the concensus is that the module is too hard, I'll tweak the attack bonuses etc to make it a bit easier. Its possible to collect quite a few NPCs into your party before getting into a fight though, which makes it considerably easier. Also, all your party members are automatically resuscitated on 1HP after a fight if they've dropped below 0, so as long as you still have one character standing at the end of a fight you're ok.
Hope it doesn't put you off having another go, I'd be interested to hear how you get on and any thoughts on how it could be improved. A wonderful story with well developed characters and companions, great plot with twists, excellent and engaging writing, interesting and memorable combat, and just the right length. This is one of those MUST play adventure modules and is one of my favorites. The are some difficult decissions to be made that change the player's experience. This resulted in multiple play throughs for me to try the different dialog options and party combinations. And the music is awesome too . The writing is so good that I often find myself listening to my "Let's Play" of The Raventhal on headphones while at work...yeah I'm a geek and love it . Great job Pongo with the new additions and artwork+animations...perfect 10 for me.